I have been doing other things besides Girl Scout related activities this summer as well. (Doesn't seem like it, but it is true). Here's a lot of pictures from the last week. One day Rowan had ABA therapy. I needed to take all the kids with me, normally we end up a little late. Somehow on this day, I was way early. So I took pictures of everyone. 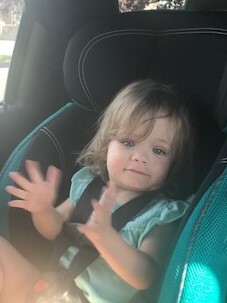 Only this one of Anastasia clapping while I sang "Baby Shark" to the Littles to keep them entertained turned out. Getting a good picture of my kids normally takes at least a dozen shots and maybe one or two will turn out well. On Thursday we decided Heidi could go camping with Grandma, Grandpa, and some of the Aunts, Uncles and ALL the cousins on Friday night. It was her first time camping in nearly 5 years and the very first time for 1/2 the cousins as well. Heidi had a good time. That afternoon she went Kayaking with Grandpa, who said she was a pretty good paddler. Heidi even got brave enough and decided to take a paddleboard out on the lake by herself. 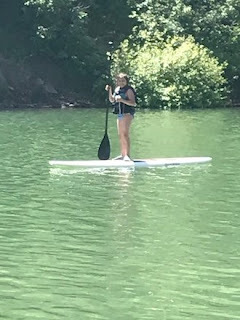 She even stood up on the board and paddled. Now, this is a child who can't properly swim. But getting up on a paddleboard-apparently is no biggie to her. Aunt E sent us the photo of Heidi. Rowan noticed that the night before Heidi went somewhere with her sleeping bag. He kept asking for a sleeping bag. I got out our other sleeping bag for him. He was all smiles and giggles once he got in it. Then asked for a pillow. 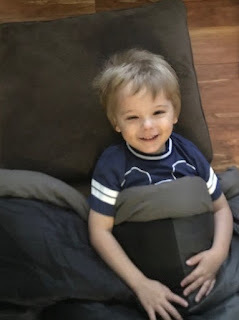 Shortly after this picture, he moved onto the sofa with the sleeping bag in tow. Who knew that hardwood floors aren't that comfy to lay on? On Sunday I went down for a Father's Day family get together at Grandma's house. (Char had work). 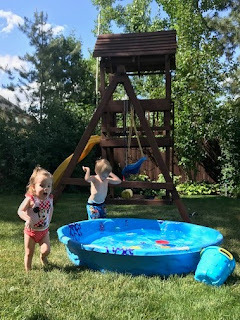 I packed the Littles' swimsuits just in case there was water in the wading pool at Grandma's backyard. There was water so I put the kids in their swimming suits. I LOVE Anastasia's face as she runs away in this picture as Rowan is about to slash the water really hard and far. Anastasia is slowly growing accustomed to water but isn't a big fan of it yet. 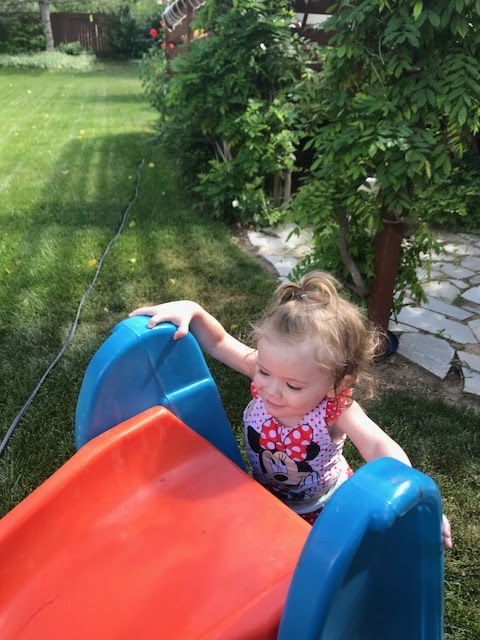 Rowan took a break from the water briefly to go down the slide. Anastasia dutifully followed him. However, this slide is a little higher than our slide at home. She struggled a tad bit but got up in the end. 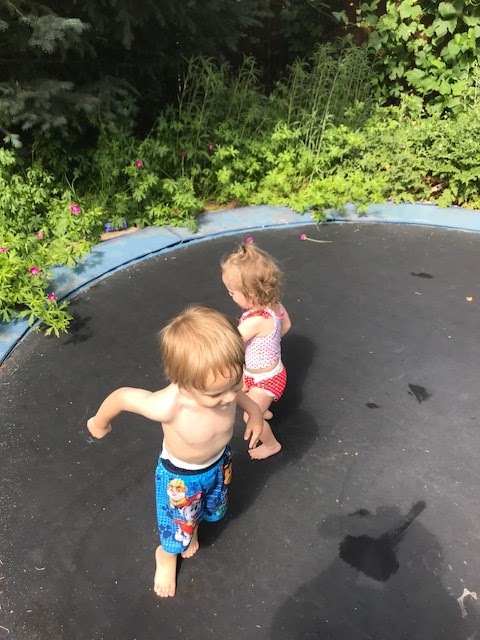 Later they decided to play on the trampoline together. They can be anywhere from thick as thieves to "don't even look in my direction." Mostly, they get along wonderfully and are as close to twins as I'm ever going to get. On Monday, I was attempting to do laundry. 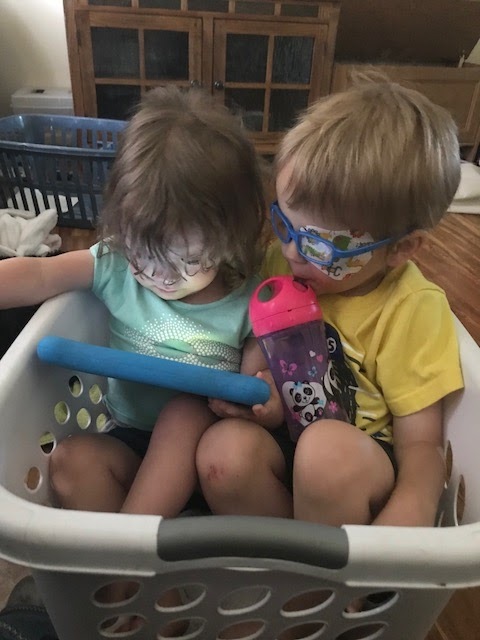 Rowan and Stacy commandeered one of my baskets to sit in and watch their kindle (which is named Turtle for some reason that only they know). Why they didn't choose the bigger blue one with more room, I'm not sure. However, I put it to good use. Tuesday evening there was a Swimming Party for all the Girl Scouts in our community. I renewed Heidi for next year while at the party. She is just loving Girl Scouts and it's exposing her (and me) to so many different subjects, activities, and potential hobbies. I wish I had enrolled her when she was younger. I'm so putting Anastasia in Daisy's when she's 5. On Wednesday we had a doctor appointment. 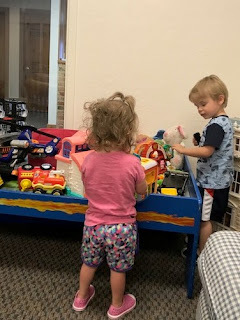 The Littles had a blast in the waiting room since it had new toys to play with. They would go to each other showing their new discoveries. Rowan fell in love with this big helicopter. 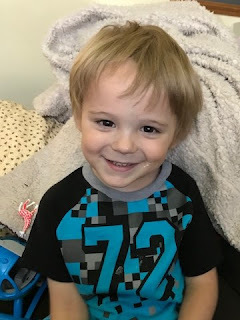 He looked up and said "Cheese!" which now means "Take a picture, please." 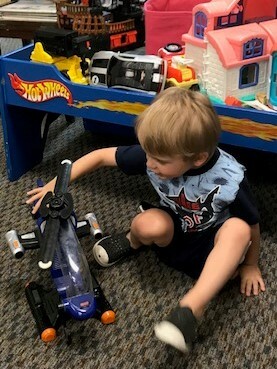 Then went back to happily playing with the helicopter. 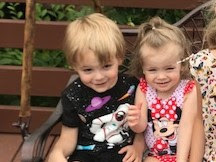 Today Rowan and Anastasia would come up to me, say "Cheese!" then rush over to try to look at my phone for the pictures. I got a really cute one out of Rowan.